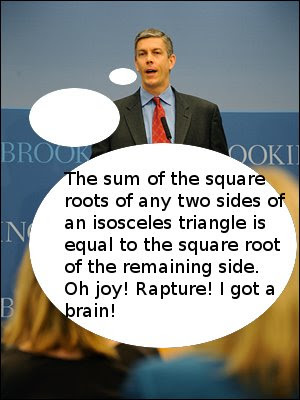 Mr. Arne Duncan, alas, may be a lightweight. I keep clicking my glittery ruby slippers hoping otherwise, but he's the Scarecrow trapped in Oz--friendly, ingratiating, and maddeningly capable of holding contrary opinions. Ah, yes, the Arne Listening and Learning tour--he listened and he learned, he listened some more, and learned even more. He started a blog, displaying his technological prowess. And after weeks and weeks of listening, he grasped a subtle point. The people do not like the No Child Left Behind, and uttered "The name 'No Child Left Behind' is toxic." Wrinkling his brow under his felt farmer's hat, Arne thought and thought. "Ha! We shall no longer call it the NCLB!" And with a stroke of his pen the name and the logos disappeared. The little red school house was torn down. The NCLB was no more! Still, some were not satisfied. Did he not display magnificent listening ability? Did he not end NCLB as we know it? He thought and he listened and listened and thought--he put his chin in his hand, he furrowed his brow, he smiled his Scarecrow smile, and still the people were not satisfied. Do they not think I am listening? I will prove that I am listening! I will respond to my blog! Arne spent 8 minutes (almost 500 seconds!) chatting with Mr. Brenner using another high tech device, the telephone. The people rejoiced! He does listen! The US DOE issued a press release commemorating this historic moment. Education Week, "American education's newspaper of record," (they say so themselves) trumpeted the news! Arne Duncan Really Does Listen! Had Arne wanted real discourse, a quick note on the blog by himself or one of his staffers would have sufficed. Even without a press release. Arne, here's how it works--you post, folks comment, you respond. On the blog. Publicly. The phone call is a nice touch, and two bonus points if you Skyped, but without a transcript, all we know is what your press trumpets. That's not public policy. That's the cult of personality. And you're not Dorothy. At least some of Duncan's supporters know how to do this. Enter Tom Vander Ark, a " long-time friend and supporter of Duncan's" and partner of VA/K (Vander Ark/Ratcliff). Mr. Vander Ark prides himself on being the first business executive to serve as a public school superintendent. He was the Executive Director of Education for the Bill & Melinda Gates Foundation. Shucks, "Newsweek readers voted Vander Ark the most influential baby boomer in education" back in 2006. He's got mojo. Someone at his firm likes to drop notes into blogs such as The Perimeter Primate. The Perimeter Primate is a mother and a parent coordinator who has children in public school. She's bright and can think on her own, both admirable qualities in a democracy. Can't say you are really adding to the debate with this... Please lower the venom level and consider dropping the personal attacks. edreformer linked himself to Vander Ark's firm. Was it Tom Vander Ark himself? No way to know. I read Tom's blog yesterday--he's "cautiously optimistic about Green Dot-style charter conversations [sic] of failing secondary schools." He also said that he was "thankful for an Education Secretary that gets it (and is trying hard to get it done)." I’d also be curious to know if he’s a client of VA/R. That comment is still awaiting moderation, and may still be waiting when water solidifies in Hell. SEE UPDATE BELOW. If Tom Vander Ark is a true friend of Arne's, working from the goodness of his heart, he might consider pulling Arne aside, explaining to him how blogging works. He might even write a comment or two for his buddy. If Tom is a proponent of open, honest discussion, he might consider telling edreform to knock off hit-and-run comments and instead urge him to engage in discussion. A good start would be using his real name. 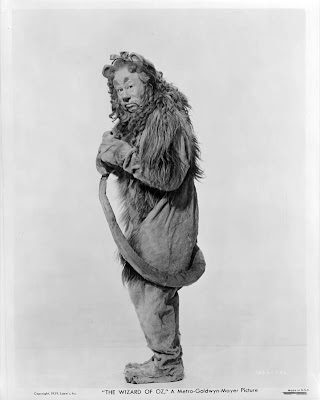 Or maybe he's playing the Scarecrow's friend, the Cowardly Lion. 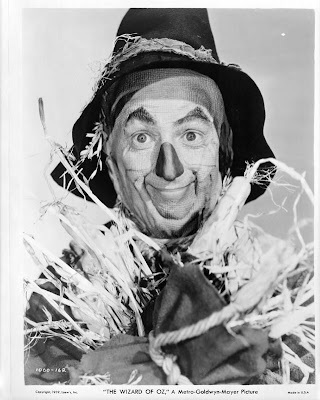 Yes, I know that the stated theorem is wrong--I was quoting the Scarecrow. The photo is from the US DOE website--the mangled cartoon bubble is mine. UPDATE: Mr. Vander Ark has responded to my comment on his blog--Mr. Duncan does not use VA/R. Not a client, just a great guy trying to do the right thing. We’ve been talking about standards and accountability for 20 years and few officials-appointed or elected-have had the courage to make tough calls. Over the 10 years that I’ve know him, I appreciate that Arne has always has the best interest of kids in mind. He’s hiring great folks and approaching the challenge thoughtfully. I'd venture that the errors in the response speak for themselves--looks like the standards and accountability came a generation too late for some of us. UPDATE 2: I attempted to post on Duncan's blog yesterday. I realize it needs moderator approval, but a post newer than mine has hit the comments. I did not save it because it did not occur to me it would not be posted (it fell within the guidelines), and because, well, I'm an idiot. But now the Chicago Civic Committee, the city's ruling elite, has turned on Arne Duncan and in a report released yesterday, titled "Still Left Behind," attacked the Duncan-led Chicago school reform as an "abysmal" failure. Ironically, it was the Civic Committee that designed and financed the Mayor's Renaissance 2010 plan--the very plan that Duncan was hired to implement and enforce. A flabbergasted Duncan, who rode the myth of the Chicago turnaround miracle all the way to Washington, tried to defend his record. But, well, 8th grade test scores did rise by a few points, was the best he could do. The truth eventually had to come out--either Duncan believes what he says, and is incapable of critically analyzing his own data, or (and this is what I fear) he knows exactly what he's doing, and is following an opaque agenda. I'll take Vander Ark at his word for the moment; I'd still like to know what triggered his response on your blog. I like this! It's much more insightful and well-researched than my chicken-scratch drawings on my blog.